NEW VIDEO!! One of my favorite “Salad for dinner” type of situations here! Just back from a long week in New York where it was basically like being in Seattle with horrendous rain storms and blustery winds! And then we can back to a hail storm. Can someone please send me to the sun!? Also, after non-stop eating on the go and big dinners out with lots of wine, I need to tone it down… reel it back in… button my pants without sucking in… you get the picture. And that’s where this epic salad comes in. An easy lunch or dinner recipe that is also SO DELICIOUS. 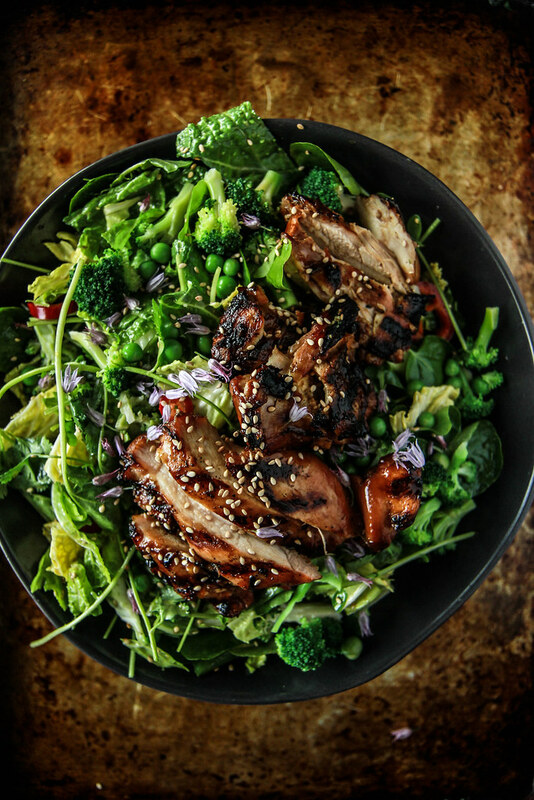 All the best flavors of Chicken Teriyaki wrapped up into one crunchy, fresh flavorful salad. The perfect solution for a healthy weeknight dinner. 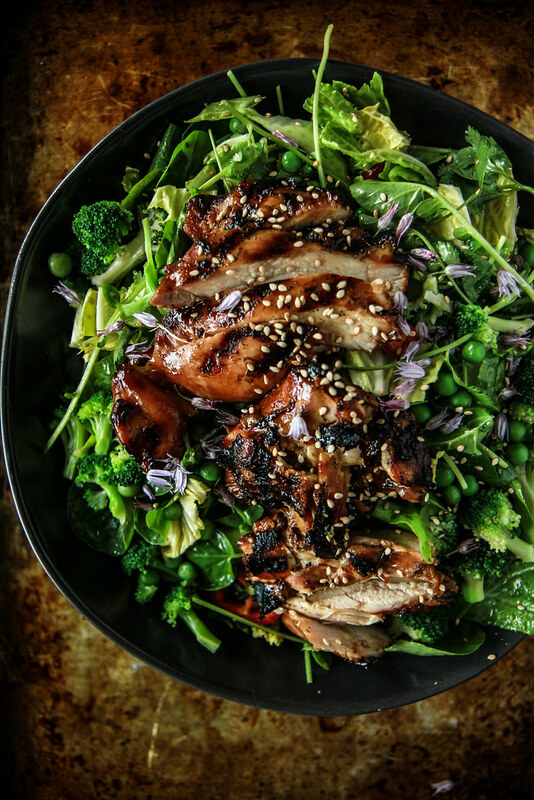 Sometimes I will make the chicken and sauce and then let my kids eat it with heaps of rice while I add it to this luscious salad for a healthier, lighter spin. But it is also good that I would serve it as a huge composed salad for company-it’s that pretty and that delicious. Enjoy! In the jar of a blender puree together the ginger, garlic, tamari, brown sugar, water and cornstarch. Puree until smooth and then reserve 3 tablespoons of the sauce in the blender and put the rest in a bowl. Set aside. Heat a heavy skillet over high heat. Add the vegetable oil and the chicken thighs. Cook them, getting a nice golden sear on the chicken- cook about 4 minutes. Flip the chicken and continue to cook another 2 minutes and then add the bowl of sauce while you finish cooking another 2 minutes. Let the chicken rest while you make the dressing. In the jar of a blender puree the three tablespoons of sauce, the chili, sesame oil, honey and rice vinegar. In a large bowl toss together the nappa cabbage, watercress, broccoli and green peas. 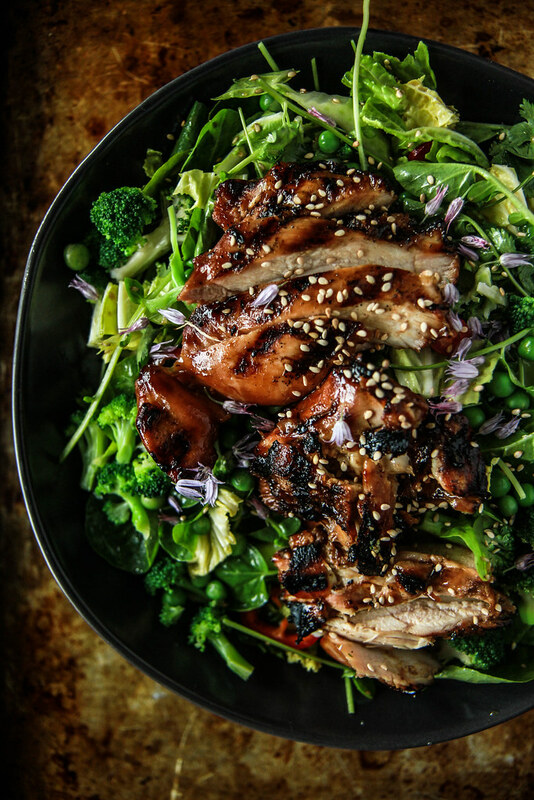 Slice the chicken against the grain and add to the top of the salad. Drizzle with the dressing and toss to coat. Sprinkle with sesame seeds and serve immediately. It looks so delicious indeed! I love your photos… And I’m going to have to add water cress to my next chicken dish! Thanks Vivian! I think you will love the peppery bite that it lends to the dish! This salad looks amazing…can’t wait to make it! I am glad I found coconut aminos to replace the tamari sauce while I’m not eating soy. Oh great Kathie! That is exactly what I do for my older daughter whom is allergic to soy! Oh my, YESSSSS! I’m so craving this gorgeous salad now! Oh mary- thank you so much- feel free to get in touch if you ever have any questions- I would love to help! My stomach literally started growling when I saw that first photo. I need this, Heather!! haha! it makes me hungry just looking at it too Julie! Hope you entered! thank you so much! LOVE this salad. YOu are so right about all wrapping that teriyaki chicken up in some crunchy goodness–such a great idea! Stunning and delicious! I want to eat this for lunch and dinner today. I so need this salad in my life. Dream dinner! Thanks Laura! I think you will love it! This looks like it came straight from a gorgeous restaurant! Stunning meal Heather!! Would you happen to know the carb numbers on this wonderful looking dish? My doc has put me on a low carb diet…yay me! Such a perfect salad when you get a craving for takeout! I have been diagnosed with Celiac disease and lactose tolerance as well, shrimp dish was very good but my gluten free pasta fell apart, next use penne, thank you come on the web page, was Tired of throwing my food away constantly. My name is Frank send you my email. Big thank you from Holland, cooked this several times and everytime delicious!